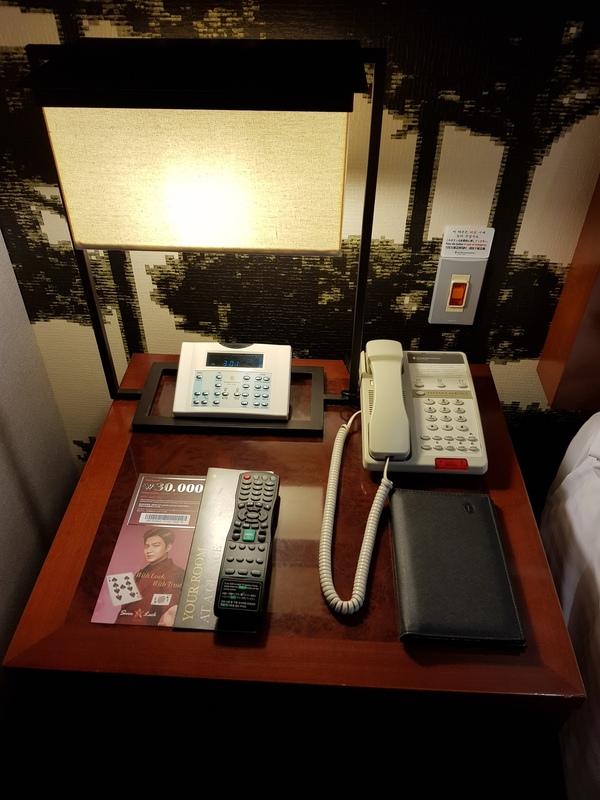 Finally I have a chance to review a 5 star hotel in Seoul! 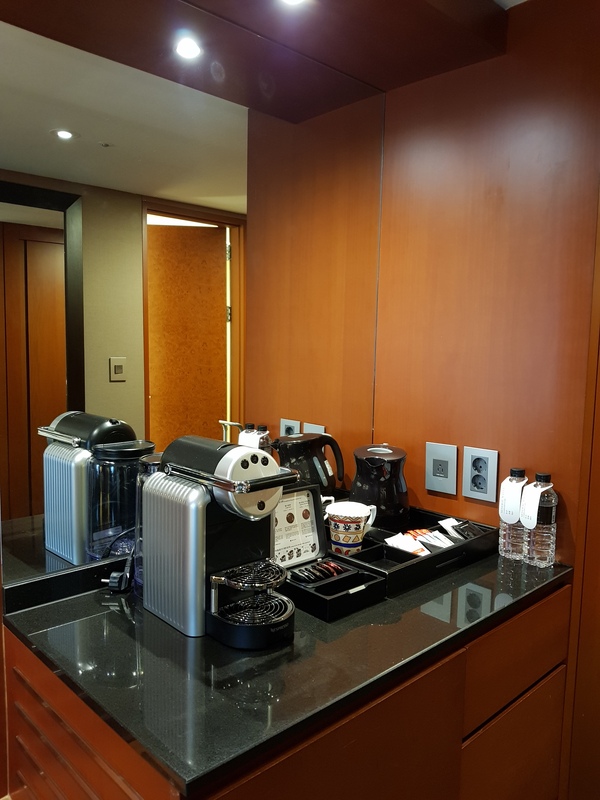 Due to wanting to maximise my travel/shopping budget, most of my trips to Seoul have been in 3 to 4 star hotels thus far and while I’m certainly not complaining about past trips, I’m pleased at the elevated standard of my last few trips to Korea. The InterContinental Seoul COEX Hotel has a prime location in Samseong/Bongeunsa area, with access to subway stations of 2 different lines. If you had to attend a convention at COEX then this would be the perfect place to base yourself at. 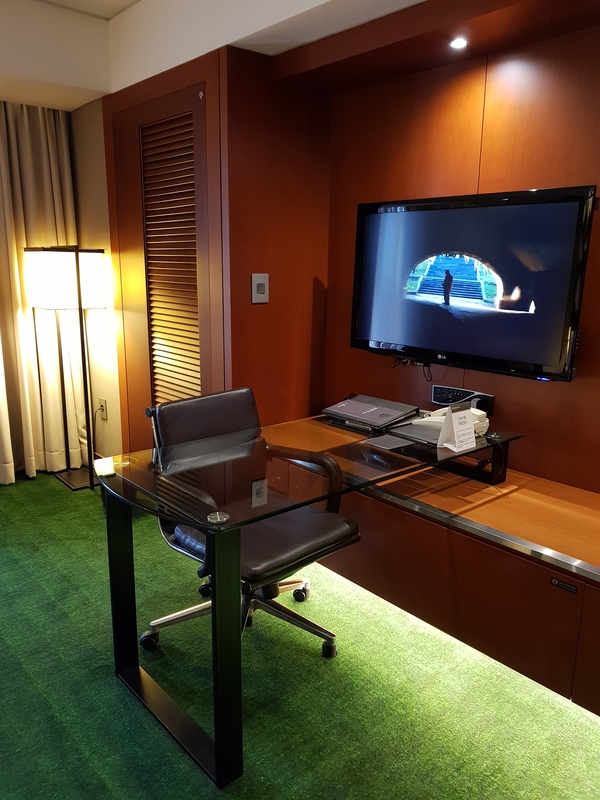 As my bookings were always made under SMTOWN Travel, I believe this is the Standard Room but it was well appointed as befitting an award winning hotel. I found it really interesting that there is an alarm button on the wall beside the bed. I guess it is a good thing to have but I did wonder if the staff are trained well enough to respond to any scenario where the alarm button is triggered? Luckily I had no need to use the button so my imagination goes unanswered. Your usual office desk and wall mounted TV. I didn’t really like the positioning of the table being right under the TV. Makes for uncomfortable television watching unless I’m in bed. 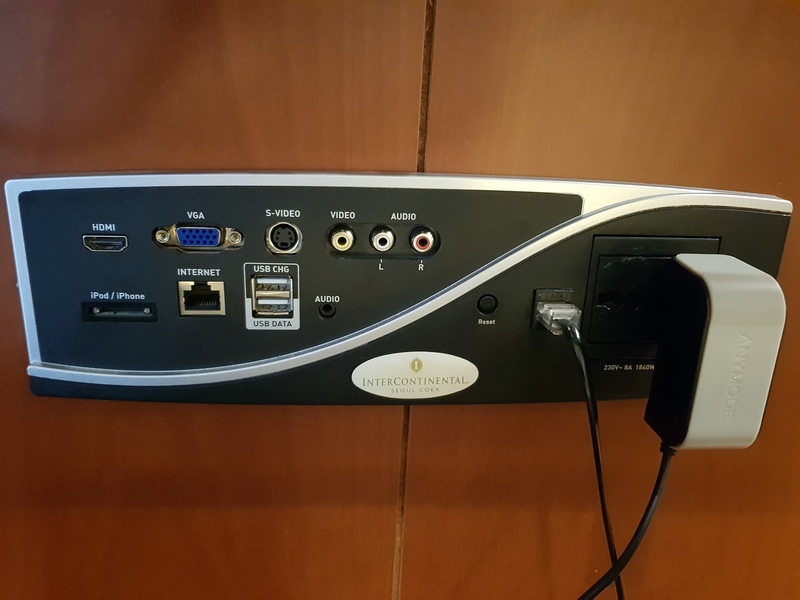 Under the TV you’ll find this wall unit which provides an array of points to plug in your electronics; sadly the USB charging port was not working. Luckily though the WiFi is always good at the InterContinental and does not require any passwords or log ins to use. Coffee machine! I always appreciate coffee more when it comes from a capsule compared to coffee from a sachet. Maybe it’s just me but it certainly tastes better! 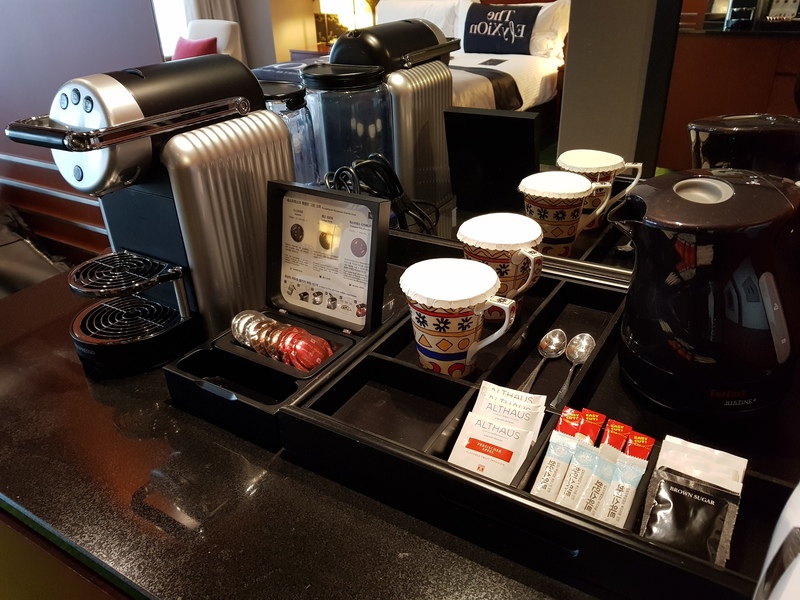 A closer look at the coffee/tea amenities provided. Again, I love that machine. 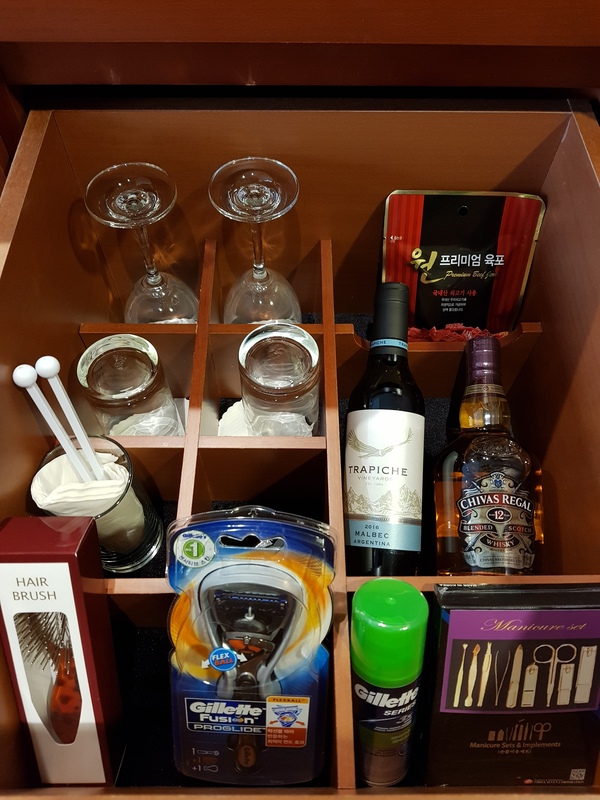 The hotel room is well stocked with a variety of mini bar items and amenities for travellers to buy in the event you forgot to pack anything or are attacked with late night hunger pangs. Apparently one drawer of saleable items was not enough and lo and behold, a second drawer of all the stuff you might conceivably need while staying there. It’s been a while since I’ve seen mini bottles of liquor with each brand in duplicate. 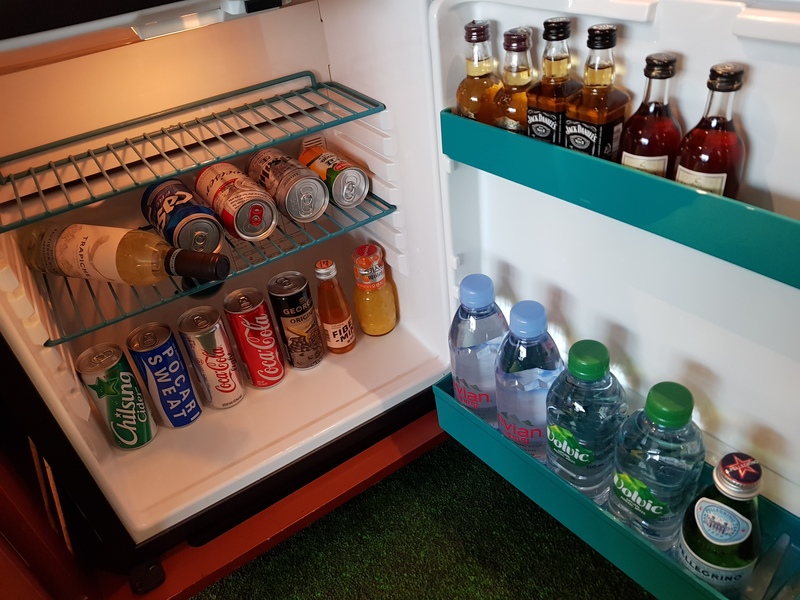 A gentle reminder that consumables from the mini bar is of course, chargeable. 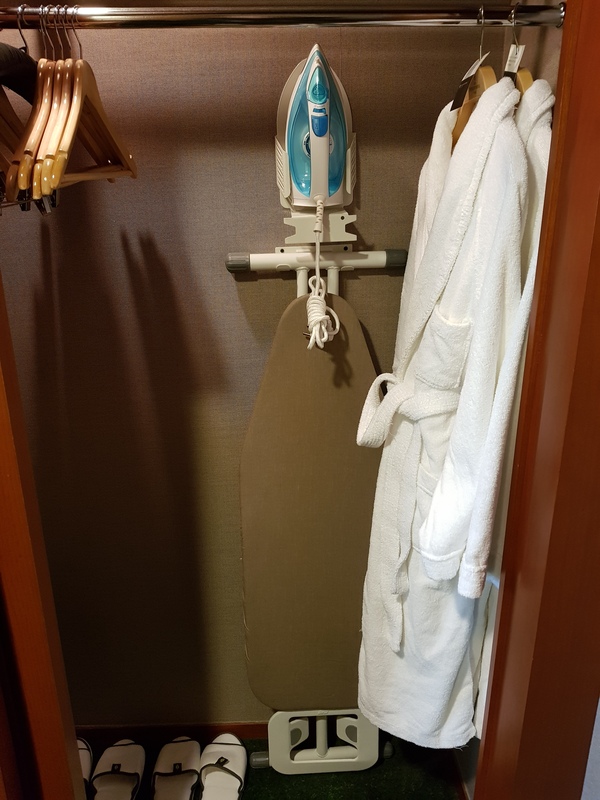 I liked that the wardrobe had something every business traveller needs if you don’t use the hotel’s laundry service – an iron and ironing board. The other side of the wardrobe had a good sized safe and safety equipment. 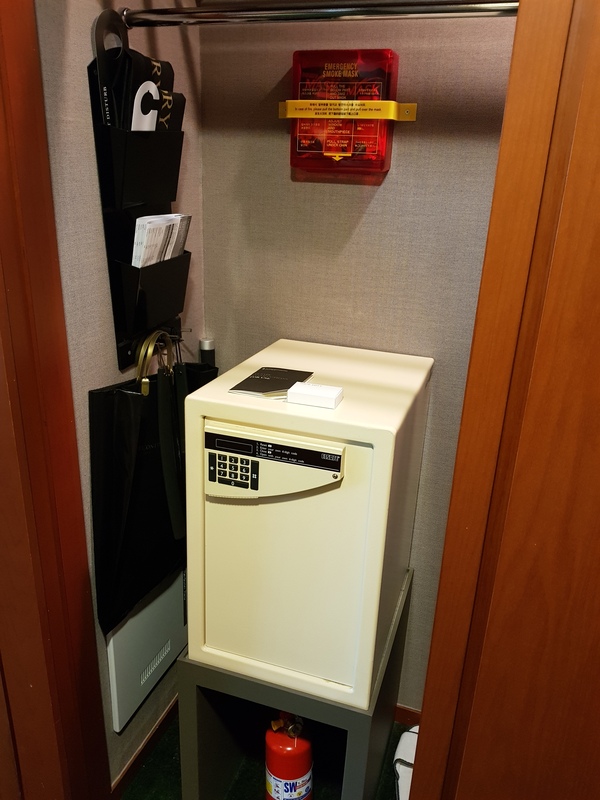 Maybe it’s just the InterContinental, but I’ve yet to see another hotel room or design that prominently features the safety equipment for guests. 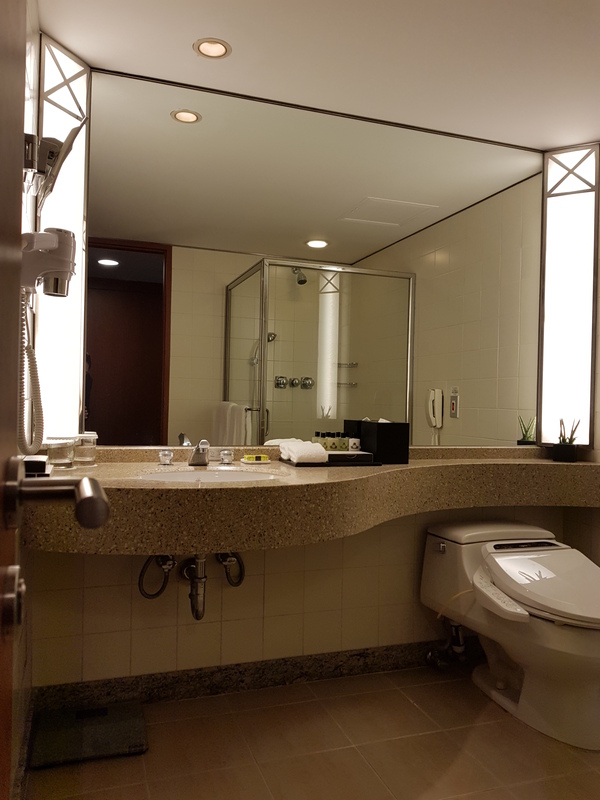 A really good sized bathroom that could use a bit of a refresh because the design makes me think of the 90s. 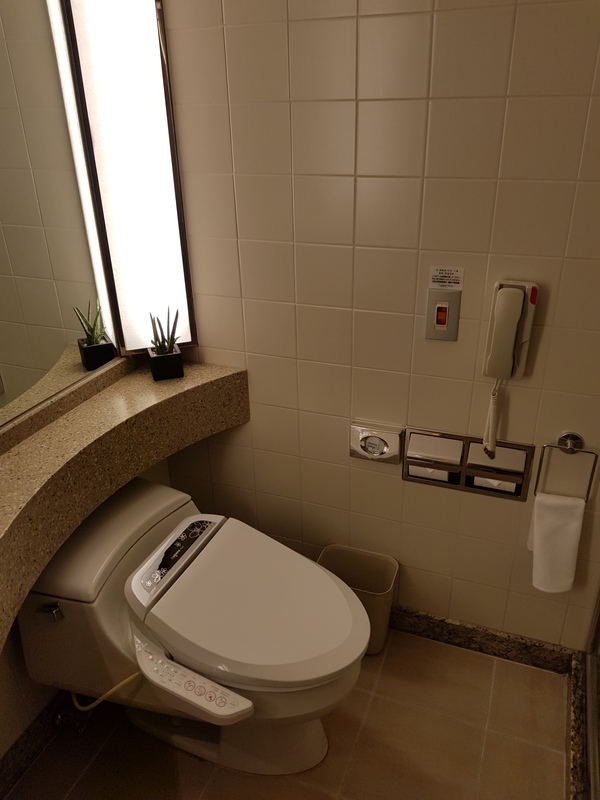 A bidet is quite standard in hotels in Korea and the heated seat is so welcome in the winter months! Another alarm button in the bathroom too, in case of emergencies. 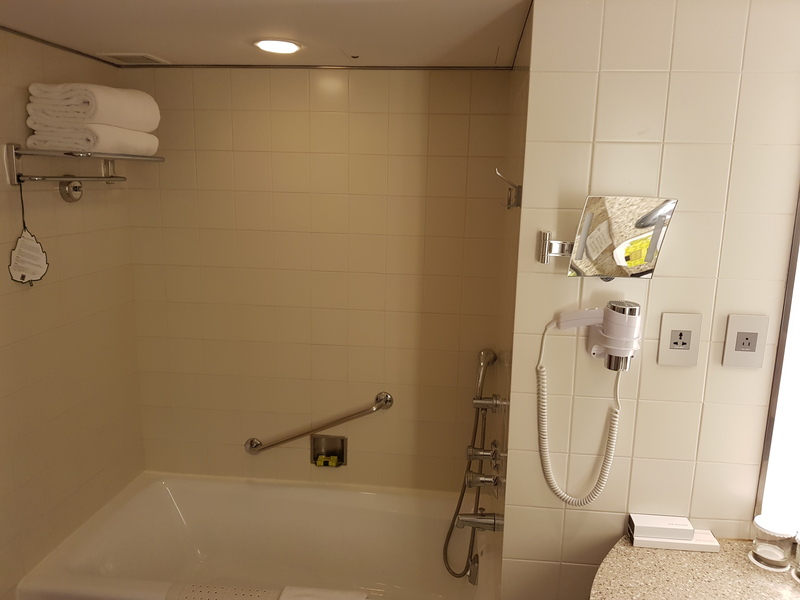 Again, a nice sized shower stall. I like how the bath towels are nice and big, almost like pool towels really. If you prefer a nice soak in a bathtub there is one as well but again, very utilitarian in design. 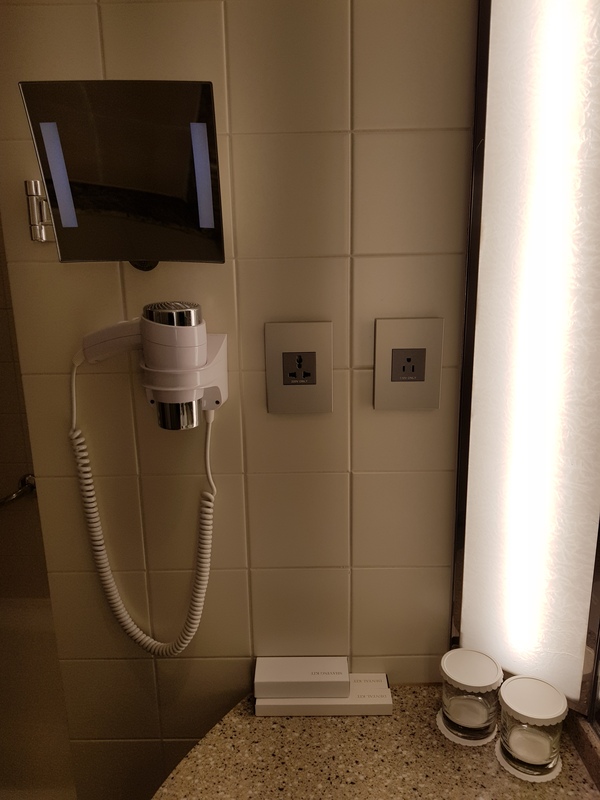 Wall mounted hair dryer and magnifying mirror with light. 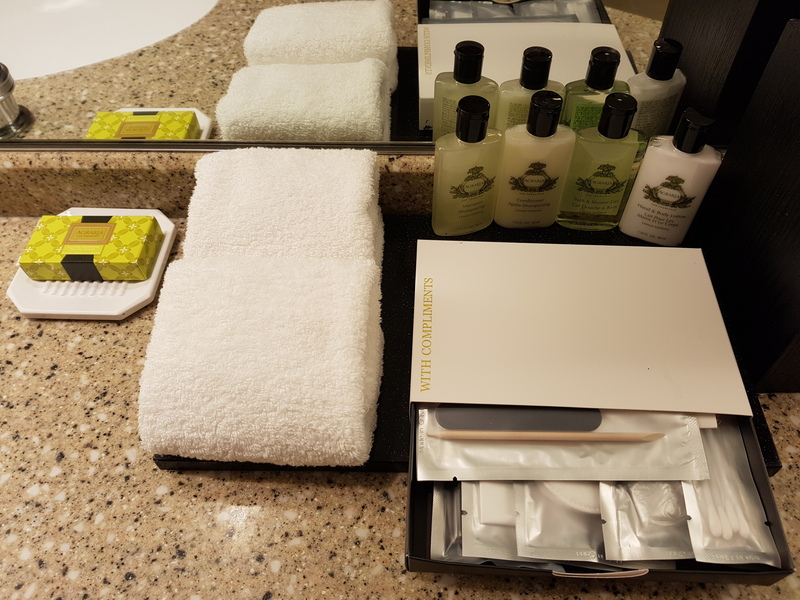 In some rooms the batteries for the mirror needed replacing so I guess that’s not on the list of things to check by housekeeping. If you find yourself in search of the nearest 24 hour convenience store, it is a short stroll across the the road – not too bad even in winter. 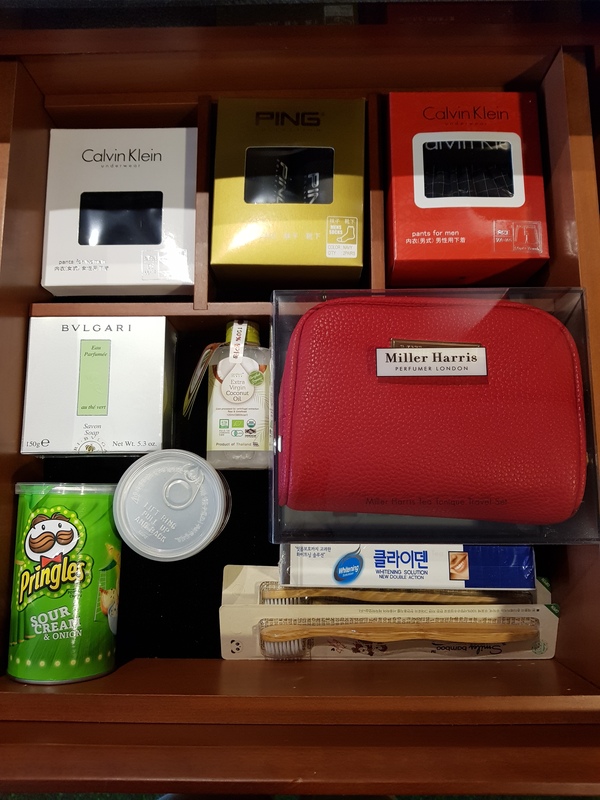 I can’t express enough how the InterContinental is perfectly located with the COEX and Starfield shopping mall plus well connected to the Bongeunsa and Samseong subway stations. Getting there by airport bus was rather complicated as each time the bus stops you at the intercity COEX terminal and you then have to navigate through the shopping mall to reach the InterContinental. But, when heading back to the airport the KAL airport bus does pick you up directly from the hotel lobby so that’s a plus point in my books.